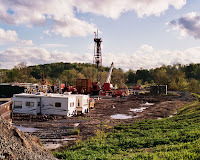 Rural Action Energy Committee will host a presentation by Chris Perry and Tom Tomastik of the Ohio Department of Natural Resources on the subject of Ohio's Regulations on Natural Gas Development and Disposal of Oilfield Wastes. This is part of an ongoing series of presentations to provide information to the landowners of the area on the topics associated with the new methods of deep natural gas exploration. Education on this topic is a common goal of Rural Action, the Sierra Club and the Appalachian Ohio Alliance. The presentation will be Tuesday, February 22 at 5:30 p.m. at The Plains Library and is expected to last no more than 2 1/2 hours. The library is at 14 S. Plains Rd. in The Plains.